One of Australia’s leading midwifery researchers with an international reputation as a scholar and leader in maternal and newborn health care delivered the 2018 Tracy Maund Oration on 24 October. Professor Caroline Homer AO, Co-Program Director of Maternal and Child Health at the Burnet Institute, discussed the changes to collaborative obstetric and midwifery care over the decades and called for greater integration between the two disciplines to improve choices and outcomes for women and newborns. Prof Homer’s Oration highlighted historical milestones in the formation of midwifery as it is today, including an interesting mention of our hospital in a news article of 1915 announcing the establishment of the Midwives Act 1915, which stipulated those registering as a midwife must hold a certificate in midwifery from the ‘Women’s Hospital Melbourne’. Prof Homer provided food for thought on how hospitals and healthcare systems can continue to collaborate and innovate into the future, whilst acknowledging how far clinical collaboration has come. She discussed the limitation placed on female clinicians in the past and advocated for more women to be placed in senior clinical roles today. Prof Homer’s parting comments encouraged the audience to “learn and train together” to ensure true collaboration between all health disciplines – medical, nursing, midwifery and allied health, to provide the best possible patient-centred care. 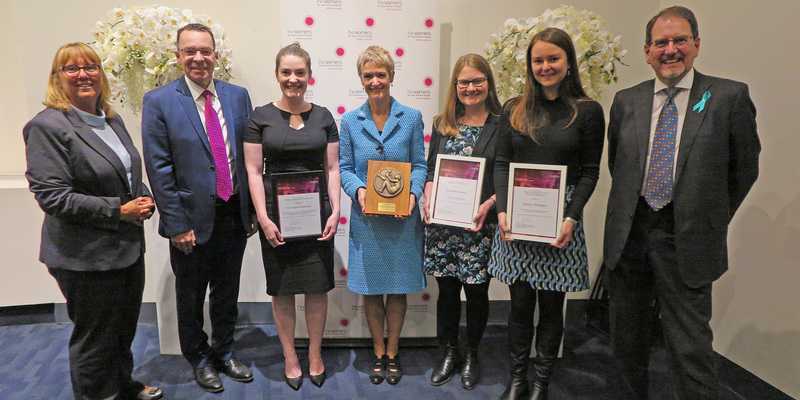 The annual Tracy Maund Oration honours the two founders of our hospital, Richard Tracy and John Maund and includes the Rex Betheras Prize in Neonatal Services as well as the Medical Student Awards, highlighting the strong collaboration between the Women’s and the University of Melbourne School of Medicine. Professor Homer received the Tracy Maund Medal. The Women’s celebrated the annual Tracy Maund Oration and Medical Awards, with Safer Care Victoria’s CEO Professor Euan Wallace the Orator discussing the improvements in healthcare over the past 160 years and the opportunities for Victorian hospitals to further progress.